The largest and best-preserved Bronze Age wheel in Britain has been uncovered at Must Farm, a site described as Peterborough’s Pompeii. The wheel will extend our understanding of early technologies and transport systems. The discovery of the wheel demonstrates that the inhabitants of this watery landscapes had links to the dry land beyond the river. Archaeologists working at Must Farm, a Bronze Age site near Peterborough, have uncovered a 3,000-year-old wheel, the first and largest complete example ever to be discovered in Britain. The find, which will broaden our understanding of Late Bronze Age life, is the latest from a settlement described as Peterborough’s Pompeii. The large wooden round houses, built on stilts, plunged into a river after a dramatic fire 3,000 years ago. Thought to date from 1100-800 BC, the ancient wooden wheel is one metre in diameter and has been so well preserved by the silt that it still contains its hub. An incomplete Bronze Age wheel was found nearby at Flag Fen in the 1990s but the Must Farm find is unprecedented in terms of size and completeness. The discovery poses challenges to what is known about the Late Bronze Age in terms of the technology available 3,000 years ago. The find is the latest in a series of discoveries at the Must Farm site which is providing an extraordinary insight into domestic life 3,000 years ago. Excavation has already revealed circular wooden houses believed to be the best–preserved Bronze Age dwellings ever found in Britain. 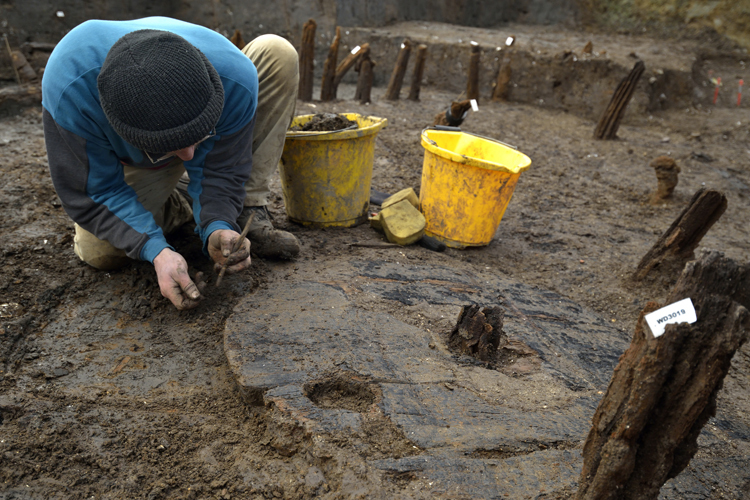 The large wheel was unearthed just a few metres away from the biggest round house on the site. Other exciting finds include a wooden platter, small wooden box and rare small bowls and jars with food remains inside, as well as exceptional textiles and Bronze Age tools. After a catastrophic fire, the houses collapsed into a slow-moving and silty river, which preserved their contents in amazing detail. Historic England (formerly known as English Heritage) and building products supplier Forterra are funding a major £1.1 million project to excavate 1,100 square metres of the Must Farm quarry site in Cambridgeshire. The Cambridge Archaeological Unit, Division of Archaeology, University of Cambridge is over half way through the excavation which is taking place because of concerns about the location and future preservation of the site. The remains cannot be preserved indefinitely in situ and need to be recorded and analysed so that the unique site of Must Farm can expand our knowledge of the Bronze Age. Once the excavation is finished, the team will take the finds for further analysis and conservation. Eventually, the objects will be displayed at Peterborough Museum, Flag Fen and at other local venues. The end of the four-year project will see a major publication about Must Farm and an online resource detailing the finds. The oldest Bronze Age wheel in Britain is the Flag Fen wheel which dates to c1300 BC but is incomplete and is smaller at 0.8m in diameter. 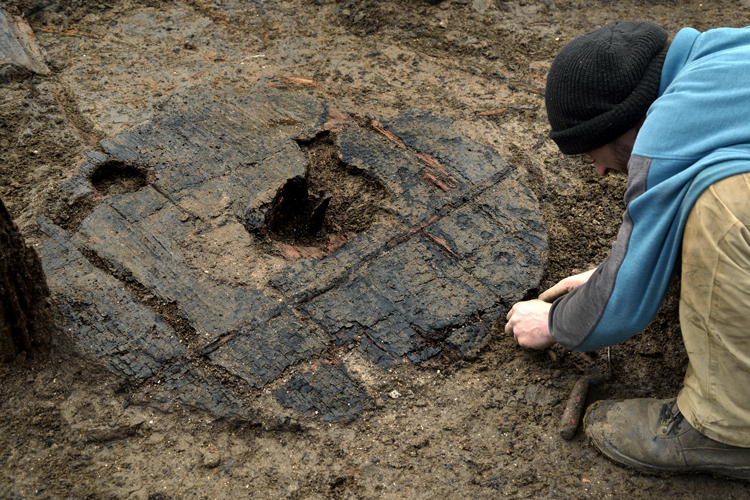 Part of a Late Bronze Age wooden wheel is also known from Lingwood Fen near Cottenham in Cambridgeshire. In Europe, the earliest wheels date to at least 2,500 BC, in the Copper Age. The Must Farm site is close to modern-day Whittlesey, Cambridgeshire, and sits astride a prehistoric watercourse inside the Flag Fen basin. The site has produced large quantities of Bronze Age metalwork, including a rapier and sword in 1969, and more recently the discovery of eight well-preserved log boats in 2011. These finds place Must Farm alongside similar European Prehistoric Wetland sites: the ancient loch-side dwellings known as crannogs in Scotland and Ireland; stilt houses, also known as pile dwellings, around the Alpine Lakes; and the terps of Friesland, man-made hill dwellings in the Netherlands. Adapted from a press release by Historic England. Inset images: Excavation of Bronze Age Wheel at Must Farm one metre in diameter, with hub clearly visible (Copyright Cambridge Archaeological Unit, photo by Dave Webb). Excavation of Bronze Age Wheel at Must Farm one metre in diameter, with hub clearly visible.